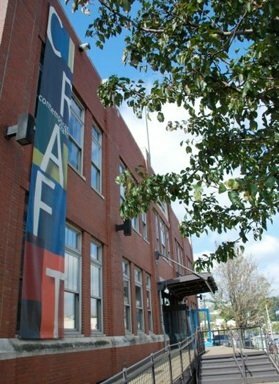 We invite you and your family for a thought provoking art experience at Contemporary Craft through our participation in the second annual Doors Open Pittsburgh on Saturday, October 7, 2017. Discover the maker in you! Explore Shelter: Crafting a Safe Home, a socially engaged art exhibition in the gallery, get creative in our Drop-in Studio, and shop artfully in The Store specialized in contemporary craft during the event! If you would like participant in a guided tour and a hands-on art activity with embroidery, RSVP with a Doors Open Pittsburgh Insider Tour tickets! Doors Open Pittsburgh will take place from October 7 & 8, 2017. This event opens the doors to some of Pittsburgh’s most impressive buildings in Downtown, North Side and the Strip District. You decide which buildings you want to explore, make a list and go. You can buy general Doors Open Pittsburgh tickets to see all the amazing Pittsburgh buildings today.